Simply warm these pre-fried shrimp on the stove or in the toaster oven for a quick and easy bowl of shrimp tendon! Simply defrost and bake briefly to use. 120g total (3 tempura-fried shrimp, 30g tare sauce). Made with safe black tiger shrimp, raised in Indonesia without antibiotics. These shrimp come pre-fried in oil, making them quick and easy to prepare: Once the shrimp have been defrosted, they need only to be warmed in a toaster oven before use. They are coated with batter at a rate of 55%. Shrimp is a good source of vitamin A, zinc, and selenium. A large serving of shrimp will also take care of an entire day’s recommended intake of vitamin B-12. Defrost in microwave/Bake in toaster oven. First, take out the tare sauce and allow it to defrost at room temperature. 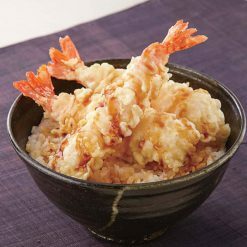 Arrange the tempura-fried shrimp (still frozen) on a plate, leaving space around each shrimp.Microwave uncovered (in either a 500W or 600W microwave) for 50 seconds to 1 minute. Then, arrange the shrimp on a sheet of aluminum foil and bake them in the toaster oven for 3 to 4 minutes, keeping an eye on them as they cook. This will make the shrimp crunchy.Place 1 serving of warm rice in a bowl and pour about 1/3 of the tare sauce on top. Add the shrimp tempura, apply the rest of the tare sauce, and enjoy. 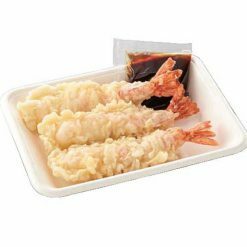 This product contains shrimp tempura: shrimp (Indonesia/black tiger), coating (wheat flour, starch, chicken eggs, sesame oil, soybean oil, glucose/dextrose), cooking oil (rapeseed, palm), tare sauce: soy sauce, sugar, apple juice, katsuobushi extract, table salt, yeast extract, cornstarch, hon-mirin, agar.. This product is not suitable for anyone with allergies to egg, wheat, shrimp, soy, apple or sesame. Origin of ingredients: shrimp (Indonesia, Vietnam, India, other). Prepared and packaged in Japan.